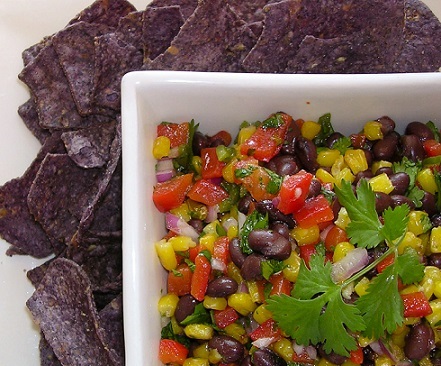 Making Black Bean Salsa is easy with this recipe. You can be enjoying a delicious salsa in minutes. What are you waiting for? 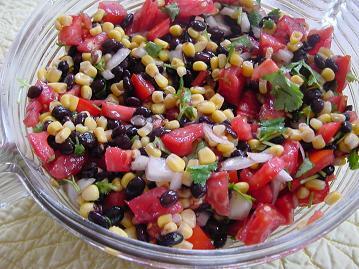 This salsa recipe is great with chips and bread, but it is also fabulous with grilled beef, fish, or chicken. The restaurant guests always love fresh salsa - all kinds of salsas with appetizers and entrees. This is a favorite restaurant recipe, not just because it tastes so good, but because it goes so well with so many entrees. Spooned across meat or fish or chicken, this salsa will turn an ordinary meal into an exotic cuisine. The salsa delights the senses and makes meals lively. And sometimes you might add jalapeños for more heat when you or your guests are looking for even more "life." You'll love to cook and to experiment with salsas. Take this recipe and "make it your own" by "tweaking." It really is great fun. 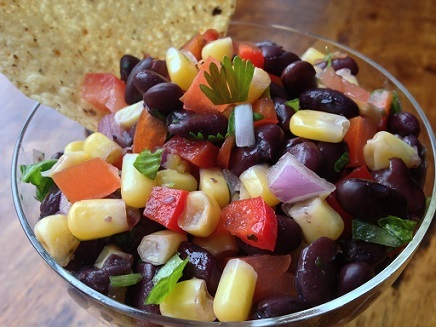 Enjoy this restaurant recipe for Bean Salsa and the company of those you share it with! Did you know? Salsa has now passed ketchup as America's favorite condiment. Isn't that amazing?